Do you really want to live in the French countryside? When I thought of buying a house in the country, this is what I thought it would mean. Dinner parties with friends, lovely table settings featuring flowers and ferms from my own garden. Silver from the States, china from France, what a lovely blend of cultures. Etc. Wrong. This photo was lifted from a beautiful book, “Tables Fleuries,” probably all rights reserved, so if the photo goes missing, you know I was hit with a threatening letter from an irate lawyer, nattering about copyright protection. I hope it’s not the one I live with, that being precisely his line of work. Then again, maybe that would give me some scope for negotiation. In my life, dinner parties happen in Paris. Given the scrub that passes for plantings on my balcony, the cramped kitchen and the lack of decent storage, my guests are lucky to get food on the table. 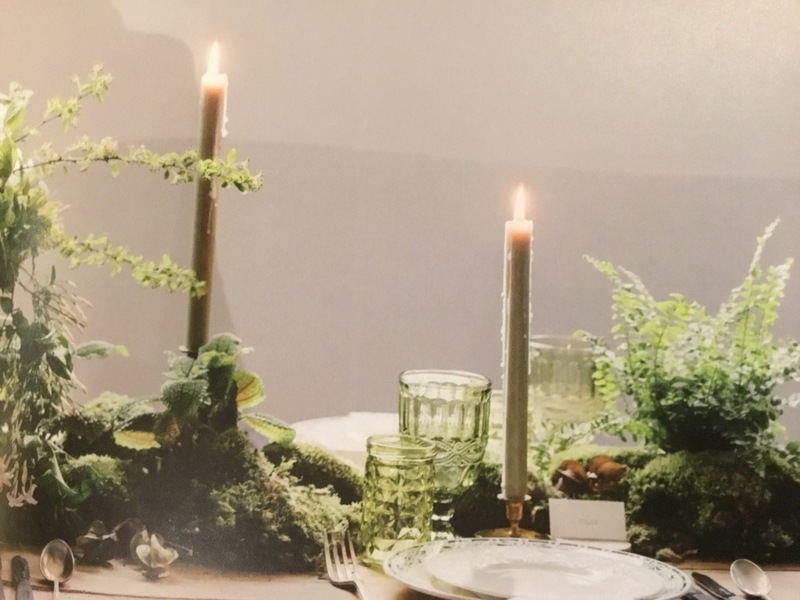 And going to a florist for a setup like this, oh, my, it would cost more than the food. Plus I’d have to plate everything — no room for “family style” serving bowls — and I’m too lazy for that. Here in the country, no dinner parties, so no problem. This is my country life. This is what passes for big excitement around here. Finally, after nearly three years owning this house, things have progressed to the point that the garbage disposer was installed. If you live in the States, you grew up with one of these. Over here, no, it’s unheard of. 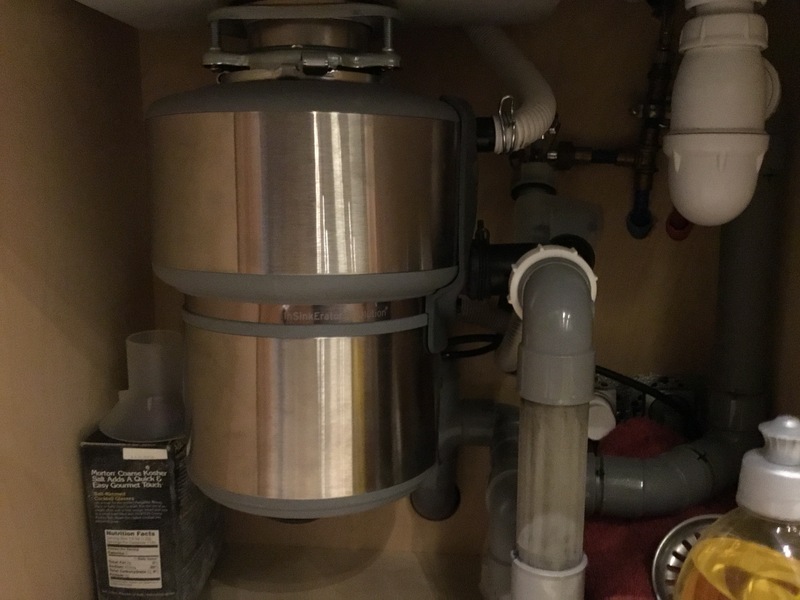 I had three electricians walk away from this basically DIY-level installation and I got the disposer itself through Amazon, shipped from England. This little baby is what keeps food waste from mummifying in the landfill. It goes down the chute, pauses to be ground up, then off to the water treatment plant. Not only is it wildly convenient, cutting smell in your trash and Destop/Drano bills like you wouldn’t believe, but I think from an ecological perspective, it makes sense, in much the same way as electric cars do. Think about it. Electric cars do create pollution. It’s just that they pollute at the power plant rather than on the road. Presumably it is easier to clean up one power plant than thousands of cars. So. Here is the deal on living in an unfashionable part of the French countryside. Your friends from out of the area will not visit you. Okay, one or two out of the whole lot, as a once and done kind of thing. All those warnings about people who come and stay and hope for chauffeur and maid service, etc., those must be Brits writing that, given that their friends live a lot closer. Probably over time, their “friend” list shrinks in direct proportion to the number of visits like that. There isn’t much in the way of manufactured entertainment; Netflix is a lifesaver. There aren’t many places to shop, especially if you are looking for English-language books; thank you Amazon for braving the wilds of France. You’d better be able to entertain yourself. You’d better be your own best friend and in general be self-reliant. Romance, I don’t know, not an easy one; even my handyman met his wife when they both lived in Paris. So maybe bring someone with you. And, though of course you will never be French, no matter what it may eventually say on your passport, I strongly suggest that you find a way to get involved with the locals. Learn French. Anything is good but more is better. Then you have to meet people. If you work here or have schoolkids, it’s job done. If you are lucky enough to get involved with someone — at my age, with my level of crabbiness, I figure it’s a miracle that I did — you’re set. Barring that, look at those social groups in your area. They hike and eat and I don’t know what all but they do get you into the community. The chances are excellent that you will be welcomed. Pick up DIY skills. They will save you a lot of frustration. If you don’t have a hobby, develop one, maybe related to one of those social groups. I knit and garden; it’s a good thing that I enjoy both. If I were here full-time I’d join the local tennis club. Get a dog. Have a plan to move back, should you decide France is not for you. Knowing that you have an option can make it easier to choose to stay when the bureaucracy strikes, or some other maddening calamity befalls you. I am happy that I have this house and that I am in France, especially now that I have my garbage disposal. But no question, it’s a big adjustment. And of course in the end, wherever you go, there you are. You’ll be thrown back on yourself all the time, much more than in a city. Be sure that’s okay with you. Wonderful meditation on the realities of life in the country – congrats on the garbage disposal and the rest of your accomplishments in making this a truly wonderful abode! I believe you have left off a hobby – the house itself! Augh, no, I am so tired of shelling out money for this house! I want to get back to the old life to some extent, especially the photo tours. It’s unreal, Gerard. Fixing up a house like this makes photography look cheap. That’s not a good thing. All true. We’ve had four visitors from the U.S. in 12 years. But we get Belgians every few weeks, plus all summer. If you can speak French a bit, people will welcome you. I see it not just in our own case–husband is francophone and I’m fluent–but with some British neighbors who barely can get out a sentence and who were brought into our clique of friends, and not just by us. I feel bad for the people who expatriate and think they can somehow live in their original country, just at a different address. They miss so much and it has to be frustrating. At some point the pool will go in. I expect my visitor count to climb dramatically. Ha. We put in a pool for one reason: to attract husband’s daughter. She has come twice. She comes to the area every summer, but stays at the beach. Our place is too boring. Her father is heartbroken about it. Oh, well. At least you can go swimming. What, your place is not a chateau?! Hahahaha. No. It’s a maison bourgeoise. It was built for a notaire. It looks pretty imposing from the outside but inside it’s really just a roomy family home. Okay, it’s a family home big enough for basketball players and maybe an Irish Wolfhound, too, but still. No turrets, no moat, no nobility lurking in the ownership history. Every day I thank my stars that I didn’t fall for a chateau. I groan about the cost of this. A chateau would have ruined me, no joke. Finally, someone speaking sense about the transition. When I used to blog about living in rural France I was frequently upbraided by people who told me that what I wrote was depressing…not enough fields of lavender, ruddy sunflowers, croissants and pink wine, evidently. Having bought into the dream they were not going to have it spoiled by a touch of reality. Social life? I joined local groups, had a lot of fun. We had friends and family non stop during the summer – as did those French friends who hadn’t fled to the coast – but there was still the opportunity to decorate a table and lay out a super meal for local friends, though lunchtime was the preferred hour, to give time for a walk afterwards and a light supper to follow. Plenty to do in maintaining house and grounds…but shopping was a joke for years and though we were happy with the resources of the local library – the only one for miles – obtaining English language book was a matter of asking friends to bring them out. We left. Retrospective taxation was becoming a governmental habit: my husband was treated as a guinea pig in a hospital with consequent irreversible damage: systeme D had been overtaken by bureaucracy and political cronyism was becoming worse by the year. Thank you. Yes, I subscribe to those blogs that make it seem all croissants and roses. I have both here, to be sure, but you can get both in San Francisco, where I moved from. So you have to be sure of your reasons to move. I can well understand how the taxes and the whole political system would cause you to decide to leave. Not that Costa Rica is an island of good governance but, well, neither is the US any more. For the moment I doubt that either of us has any better choices. I think we are aware of all the potential issues that you and your comment buddies raise here, but I also think one of your most valid comments is the one about still being you, wherever you wind up. I/we don’t mind our own company and can self-entertain. I think some folk just can’t do that; and I respect my daughter for bringing up my grandson to be independent and self-sufficient, its a useful life skill. Re dinners, I am constantly making excuses that the house isn’t done and it’s chaos…I have a whole list of folk dropping big hints. I’m too good a cook. My friends all tell me not to worry about the mess. They’ll deal with it! Interesting first comment. I’m not sure who my audience is. I know some already live here. Others must think about it from time to time. I get visits and have followers from all over the place. But do they regularly visit France or do they just want to eavesdrop? Hard to say. I wonder who you mean?!! The attraction of Costa Rica is that there is still systeme D in operation….for the moment. I’ve given up expecting good governance and am prepared to settle for benign neglect. Thank you. I’m sure it’s not intentional but you are exactly describing my house. When it comes to house renovation, I am such a recidivist. I would invite you to consider my three-story bolthole, with land and dependances, so I could move to the next project. Fortunately for you, M. Wonderful has his heart set on living here when he retires. If you visit, and I hope you do, you can sleep soundly knowing that you are just a guest. There is no hidden agenda. Ooh. I have a real-life buddy who is a wine writer. One area he loves to cover is the Savoie area. We have to work something out. And if you have not yet done so, check out the site for Chateau Gudanes. Now there is a makeover. Previous Post No, not the holidays…..